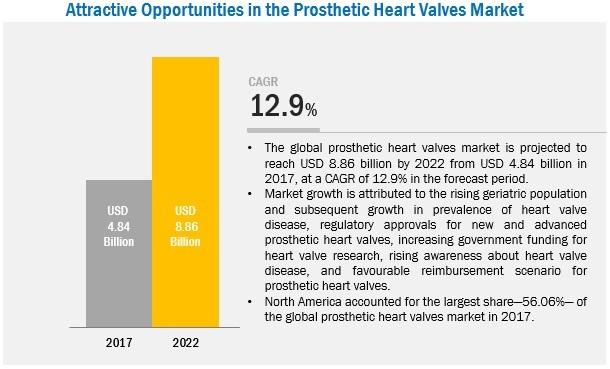 [156 Pages Report] The prosthetic heart valve market is projected to reach USD 8.86 Billion by 2022 from USD 4.84 Billion in 2017, at a CAGR of 12.9%. Market growth can be attributed to the rising geriatric population and the subsequent increase in the prevalence of HVD, regulatory approvals for new and advanced prosthetic heart valve, increasing government funding for heart valve research, rising awareness about HVD, and favorable reimbursement scenario for prosthetic heart valve. The key players in the artificial heart valve market are Medtronic plc (Ireland), Edwards Lifesciences Corporation (U.S.), Boston Scientific Corporation (U.S.), St. Jude Medical, Inc. (an Abbott Laboratories Company) (U.S.), LivaNova PLC (U.K.), Symetis SA (Switzerland), Jenavalve Technology, Inc. (Germany), CryoLife, Inc. (U.S.), TTK Healthcare Limited (India), Colibri Heart Valve, LLC (U.S.), Lepu Medical Technology Co., Ltd. (China), and Braile Biomédica (Brazil). This report aims to provide insights into the global prosthetic heart valve market. It provides valuable information on the types of valve and regions in the artificial heart valve market. Leading players in the market are profiled to study their product offerings and understand the strategies undertaken by them to be competitive in this market. The above-mentioned information would benefit the buyer by helping them understand the market dynamics. In addition, the forecasts provided in the report will enable firms to understand the trends in this market and better position themselves to capitalize the growth opportunities. On the basis of type, the global prosthetic heart valve market is categorized into three segments transcatheter, tissue, and mechanical heart valve. In 2017, the transcatheter heart valve segment is expected to hold the largest share in the global market and grow at the highest CAGR in the forecast period (2017 to 2022). The large share and high growth of this segment can be attributed to factors such as ease of implantation (involving a minimally invasive procedure rather than an open-heart surgery), increasing prevalence of aortic stenosis, and growing patient pool. The global prosthetic heart valve market is expected to reach USD 8,862.9 million by 2022. 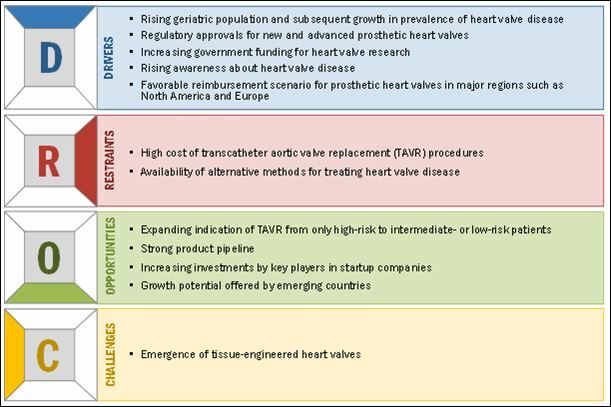 Factors such as rising geriatric population, regulatory approvals for new and advanced prosthetic heart valve, increasing government funding for heart valve research, rising awareness about heart valve diseases, and favourable reimbursement scenario for prosthetic heart valves are driving the growth of the prosthetic heart valve market. High cost of transcatheter aortic valve replacement (TAVR) procedures and availability of alternative methods for treating heart valve diseases (HVDs) are the major restraints for the market. Transcatheter aortic valve replacement (TAVR), also called as transcatheter aortic valve implantation (TAVI), is a minimally invasive surgical method used for the replacement of aortic heart valve without removing the old heart valve. TAVR is a relatively new method for heart valve replacement in patients who are aged above 80 years or in patients with a high risk of open heart surgery. In the U.S., the cost of a transcatheter heart valve ranges from USD 25,000 to USD 30,000, which is much higher than surgical valve that cost USD 5,000 to USD 10,000. Even though the cost of hospital and ICU stay in TAVR procedures is lesser than in SAVR procedures, it does not balance out the high cost of transcatheter heart valve. Moreover, permanent pacemakers are required to be implanted in some of the patients who have undergone TAVR procedures. The implantation of pacemakers adds up to the cost of the overall treatment. Reimbursement for TAVR procedures is complicated as it includes patients being examined by a multidisciplinary team, which involves multiple cardiac surgeons and interventional cardiologists. These factors are expected to hinder the growth of the TAVR market in the coming years. There are multiple alternative options available for treating heart valve diseases such as Medication and heart valve repair. Medication is used to increase the heart’s ability to pump blood, which helps compensate for the valve which is not working. Additionally, repair of heart valve can be carried out by means of open-heart surgery or minimally invasive methods. Heart valve replacement is used as a last resort. Valvular heart disease (VHD) places a significant burden on the U.S. healthcare system. According to the American College of Cardiology, approximately 5 million Americans are diagnosed with HVD every year. The number of people suffering from aortic stenosis is 1.5 million every year; nearly 500,000 people suffer from severe aortic stenosis. Moreover, around 4.0 million people suffer from significant mitral valve insufficiency, with nearly 250,000 incident cases of mitral regurgitation every year. VHD mainly affects the older population as a result of calcium buildup and scarring in the valve cusp due to aging. The prevalence of VHD in population aged 18-44 and 75 years was 0.7% and 13.0%, respectively in 2012. The rapid growth in the aging population is, therefore, a key market driver in North America. According to the Administration on Aging (AoA), the population of individuals aged 65 years and older was 46.2 million in 2014, representing 14.5% of the U.S. population. This number is anticipated to rise to about 98 million by 2060. Growth in the aging population and the consequent rise in the prevalence of VHD is expected to drive the market growth for prosthetic heart valve in the U.S.
Heart valve are fairly costly devices, with the average cost ranging from USD 25,000 to USD 35,000. Hence, reimbursement plays a critical role in the acceptance of the procedure. The CMS reimburses the heart valve implantation procedures in the U.S. The organization approved insurance for transcatheter heart valve replacement procedures in 2012, under certain conditions. The conditions include that the patient should be pre-examined by two cardiac surgeons independently, patient should be under the care of a heart team—both before and after the operation, and an FDA-approved valve and implantation system should be used. The availability of insurance coverage increases affordability and is likely to drive the number of heart valve replacement procedures in the U.S. Detailed analysis of value and volume by country wise value & volume analysis for the US, Canada, Germany, France, the UK, Japan, China, India. Company share analysis by type of heart valve. Major players and their shares provided separately for each type of the heart valve. The prosthetic heart valve market is projected to reach USD 8.86 Billion by 2022 from USD 4.84 Billion in 2017, at a CAGR of 12.9%. The key factors propelling the growth of this market include the rising geriatric population and the subsequent increase in the prevalence of HVD, regulatory approvals for new and advanced prosthetic heart valve, increasing government funding for heart valve research, rising awareness about HVD, and favorable reimbursement scenario for prosthetic heart valve. In this report, the prosthetic heart valve market has been segmented based on the type of valve and region. On the basis of the type of valve, the market is segmented into transcatheter heart valves, tissue heart valve, and mechanical heart valve. 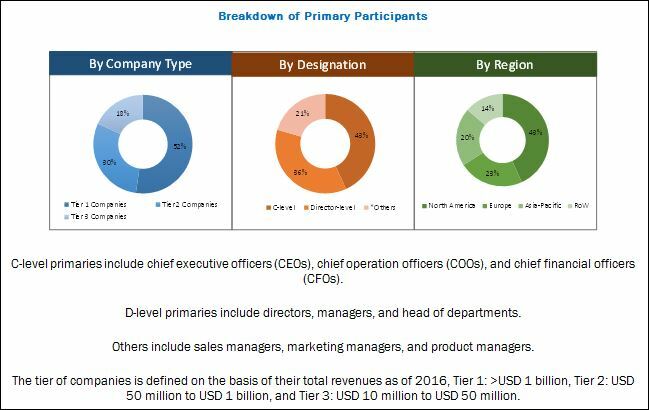 The transcatheter heart valve segment is expected to command the largest share of the global market in 2017 and is expected to register the highest CAGR of 18.0% during the forecast period. The large share and high growth rate of this segment can be attributed to the rising prevalence of aortic stenosis, increasing pool of patients owing to approvals for extended valve indications, and technological advancements. The preference for transcatheter heart valve is expected to witness high growth in the future as they are implanted through a minimally invasive procedure while the other valve types require open-heart surgery. 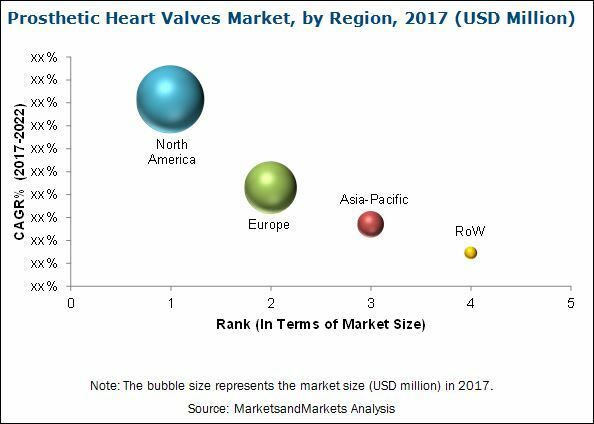 In 2017, North America is expected to dominate the prosthetic heart valve market, followed by Europe, Asia-Pacific, and the RoW. North America is also expected to register the highest CAGR during the forecast period. The large share and high growth in this regional segment can be attributed to factors such as the rapid growth in the aging population and prevalence of valvular heart diseases, favorable reimbursement scenario, and rising product approvals for heart valve are contributing to the growth of the North American prosthetic heart valve market. A majority of the leading players in this market are focusing on marketing and promotional activities, product launches and approvals, acquisitions, agreements, collaborations, and expansions to enhance their market presence and strengthen their distribution networks, cater to the needs of a growing customer base, widen their product portfolios, and boost their production capabilities. Edwards Lifesciences Corporation (U.S.), Medtronic plc (Ireland), and St. Jude Medical, Inc. (an Abbott Laboratories Company) (U.S.) are identified as the top players in this market. These companies have a diversified product portfolio, wide geographic reach, and a strong focus on innovation and research. 8.1.7 St. Jude Medical, Inc.
9.12 Lepu Medical Technology Co., Ltd.